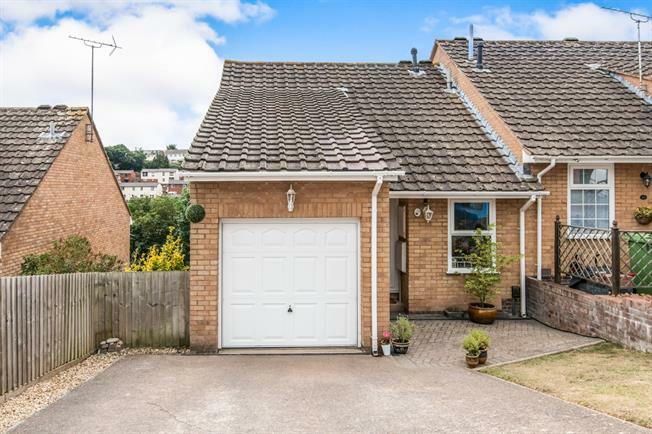 4 Bedroom Semi Detached House For Sale in Exeter for Asking Price £255,000. The property is presented across three floors and is in good decorative order through out. To the second floor accommodation comprises three bedrooms which are all generous in size as well as a family bathroom. The first floor benefits from a large kitchen, separate dining/seating area as well as an additional bedroom which would also make a great study or playroom. Finally, the ground floor consists of an lounge with direct access onto the rear garden as well as a shower room. Other benefits UPVC double glazing and gas central heating through out, a garage and a driveway. To the front of the property you will find a driveway which provides parking for one car. UPVC double glazed front door opening on to hallway. Wood effect laminate flooring. Stairs leading to first floor, hatch providing access to the loft, storage cupboard. A white and modern three piece suite comprising pedestal hand wash basin, low level WC and a panelled bath with mixer taps over. Wood effect laminate flooring, extractor fan. UPVC double glazed window to the rear aspect. Carpeted flooring, radiator. A light and spacious room comprising UPVC double glazed window to the rear aspect. Carpeted flooring, radiator. A great family room which benefits from enough space for dining and living. Two UPVC double glazed windows to the rear aspect, wood effect laminate flooring, TV aerial point. A range of matching wall and base units with a tiled splash back. Space for upright fridge freezer, freestanding oven, dishwasher and washing machine. Sink with drainer and mixer tap over. There is space at the end of the kitchen for a dining table if desired. UPVC double glazed window to the side aspect. Carpeted flooring, radiator. UPVC double glazed window to the rear aspect over looking the garden along with UPVC double doors providing direct access to the garden. Carpeted flooring, radiator. A modern white three piece suite comprising shower cubicle, vainity style wash basin and low level WC. Tiled surround and flooring, heated towel rail, extractor fan. The property benefits from a garage which is accessed by an up and over door. Other benefits to the garage include light, power and a mezzanine level which is currently used as a workshop. To the rear of the property you will find an enclosed and fully paved garden. This would be the perfect area for alfresco dining during the summer months. If desired there is enough room for a small storage shed and a trampoline.